3+ hours of audios, this intuitive experience brings the meditation for each card to life. The audio downloads are separated alphabetically by each card and in this soothing audio, Tori assists you to get into a meditative state. Beautiful cards with a depth of meaning. Creative stories that helps you remember meanings and allows your intuition to flow. The Chakra Wisdom Essentials Course stays true to its title. 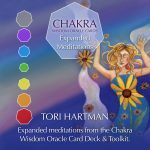 It is like a behind the scenes peek of the Chakra Wisdom Oracle cards, full of valuable information and cues to hone the multi-dimension approaches to the use of these wondrous cards. They are like an exercise class for your intuition.